Home / Game Recaps / Indana Women fall to Minnesota 65-61. Indana Women fall to Minnesota 65-61. Bloomington, IN – Hoosiers come back to Assembly Hall after losing their last two games, and just struggling to seal the deal at the end in close losses to Rutgers, and Nebraska. Meanwhile, the Golden Gophers came in tonight hot winning their last two games against Northwestern and Rutgers convincingly. At this point in the season, wins tend to become harder to get and matter more as the BIG10 approaches the Conference Tournament. Hoosiers struggled in the 1st half with stopping Minnesota from the mid range, and had 9 turnovers. Minnesota had the Hoosiers number from beyond the arc shooting 42% from 3 going 3-7 compared to IU shooting 20% going 1-5. IU was able to stop the Gophers down the stretch holding them without a basket for the final 3 minutes of the half. Leading the way for Minnesota is Kenisha Bell with 9 points and 6 rebounds. Ali Patberg is the top scorer for the Hoosiers with 6 points and also had 5 rebounds. The second half was pretty much all Minnesota. They didn’t really run away but they were on cruise control and didn’t let the Hoosiers too close holding a double digit lead most of the half until the last 2 minutes of the half. Hoosiers got as close as 2 points. Kenisha Bell was the top player for Minnesota with 22 points and 7 rebounds. The big note in the 2nd half was Ali Patberg taking a bad fall, and she came up holding her arm and shoulder, and was immediately taken to the locker room. Hoosiers played the entire 4th quarter without her. Hoosiers fell to the Golden Gophers 65-61. 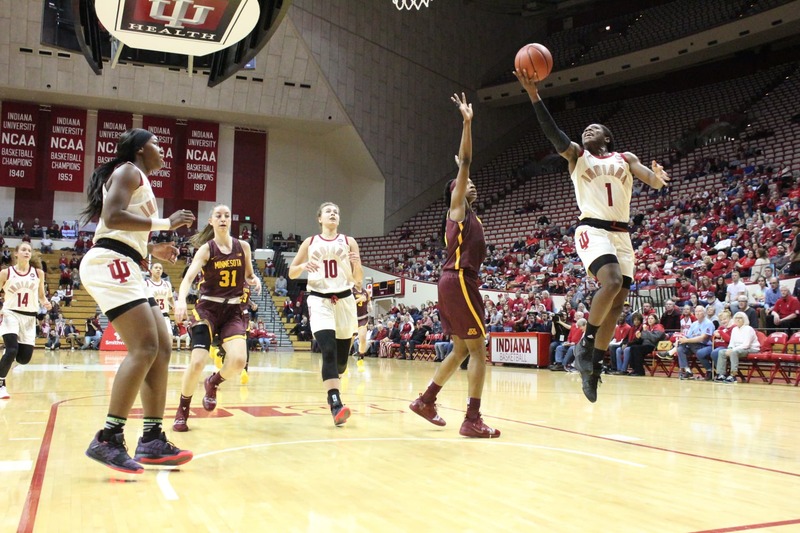 As the Hoosiers dropped their 3rd game of their last 4, and the Golden Gophers winning their third straight, Jaelyn Penn and Brenna Wise still put up solid numbers for the Hoosiers. Penn with 18 points and Wise with 8 rebounds. As we near closer to the NCAA Women’s Tournament, both of these teams are on the bubble with Hoosiers in a slightly better spot than Minnesota. But, with a win on the road, Minnesota could very well jump ahead of many teams on the bubble, especially with such a solid run this late in the season. Whereas, the Hoosiers just continue to slide down the list of teams to have a solid chance of making it. The Hoosier’s next game is Monday February 11th at Michigan State, whom they defeated a few weeks ago. You can catch that game at 7pm on the Big10 Network.